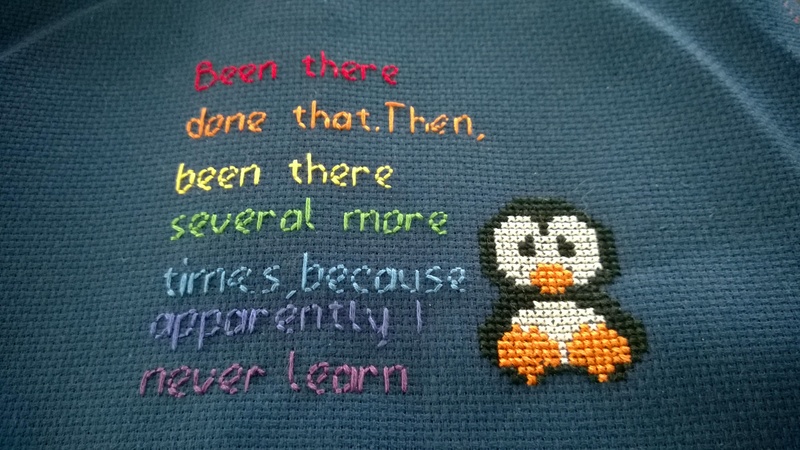 Back in the day I did a lot of cross-stitch.Back in the day I taught health and social care a bit. One of my ex-pupil posted this quote recently.She has done very well in the world and continues to impress and surprise me. It’s deliberately irregular and the penguin were a request. Have to big up Pinterest for this project.The text creator and penguin were sourced there.Little technical point I brought a square frame locally but found it really uncomfortable and difficult to tension for this project.I swapped back to an old wooden ring and was much more comfortable and able to tension the work better. It needs trimming, washing, pressing and sending to the UK. This entry was posted in Journal on March 14, 2016 by debbie. I’m still working from Cas Holmes Stitching Stories book and her wonderful article and this months Cloth,Scissors and Paper.Suddenly I realised it’s March and I have finally gathered the required supplies well almost I’m still having issues finding the correct adhesive.So instead of starting I’ve put my draft to one side will try a pilot book with will be part one of two. My stitch story focuses on my weekly walk around Hilltop.I try to make this about 1 trip every week.It means on a clear day I get to see two volcanos. Mount Baker my daily companion and Mt Rainier the volcano that dominated the Seattle skyline plus the Olympic Mountains.There are also Lake Washington the Cascades and the Spaceneedle. It truly as a top of the world trip. This entry was posted in Journal on March 2, 2016 by debbie.